De Weert begins by explaining the risks associated with trading an exotic option before dissecting these risks through a detailed analysis of the actual economics and Greeks rather than solely stating the mathematical formulae. The book limits the use of mathematics to explain exotic options from an economic and risk perspective by means of real life examples leading to a practical interpretation of the mathematical pricing formulae. The book covers conventional options, digital options, barrier options, cliquets, quanto options, outperformance options and variance swaps, and explains difficult concepts in simple terms, with a practical approach that gives the reader a full understanding of every aspect of each exotic option. The book also discusses structured notes with exotic options embedded in them, such as reverse convertibles, callable and puttable reverse convertibles and autocallables and shows the rationale behind these structures and their associated risks. For each exotic option, the author makes clear why there is an investor demand; explains where the risks lie and how this affects the actual pricing; shows how best to hedge any vega or gamma exposure embedded in the exotic option and discusses the skew exposure. 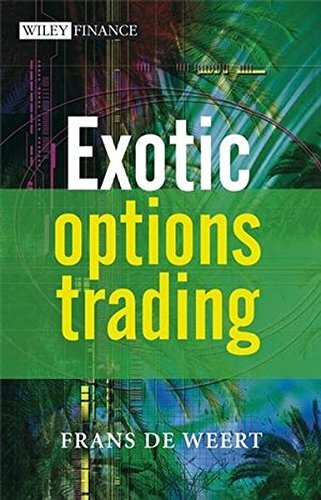 By explaining the practical implications for every exotic option and how it affects the price, in addition to the necessary mathematical derivations and tools for pricing exotic options, Exotic Options Trading removes the mystique surrounding exotic options in order to give the reader a full understanding of every aspect of each exotic option, creating a useable tool for dealing with exotic options in practice.